I’m very bad at estimating things. Numbers, age, weight. Don’t ask me to guess how old you are, you’ll probably be offended. This rarely poses a real problem until you end up buying 2 kg of butterscotch chips. I didn’t THINK it was 2 kg. On an unrelated note, I need ideas of what to bake with butterscotch chips. It’s not all bad though. You end up with things like this cake. 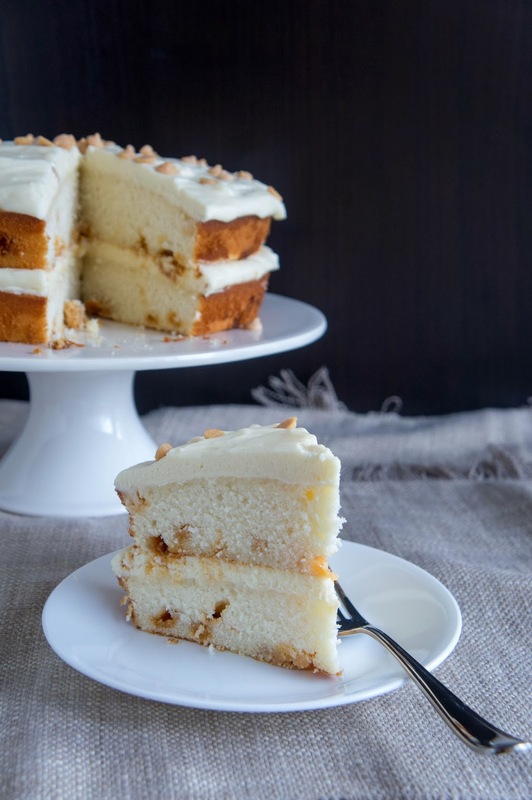 I shared this slice of cake for breakfast because I got up early to photograph it (gasp, you better appreciate!). Just look at that early morning winter light. And then, of course, couldn’t let it go to waste. It was good. Really good. I love the reverse creaming method for cakes; it makes the crumb so fine. Reverse creaming is where you incorporate the butter into the flour first, instead of creaming it with the sugar and adding the flour last. 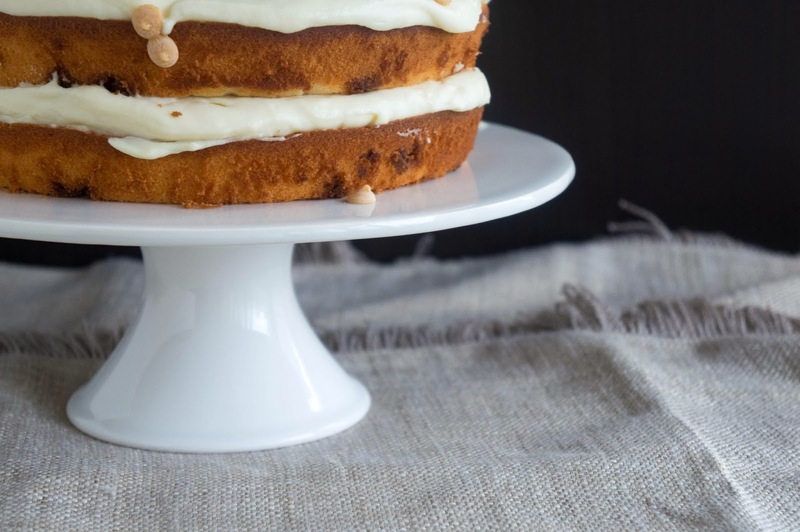 I first encountered this method in one of my favourite vanilla cupcake recipes, and was delighted to find that it was just as good in this cake. 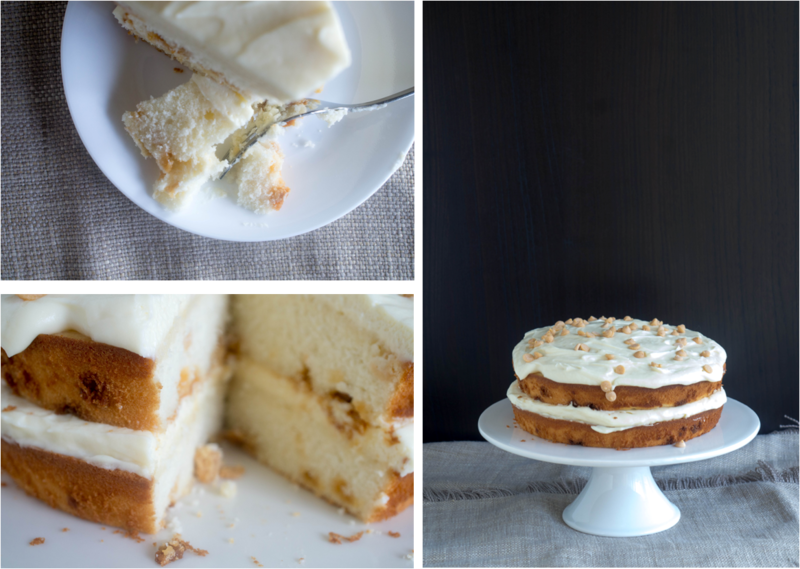 The addition of butterscotch chips makes this cake pretty sweet, so I decided to pair it with a mascarpone frosting to balance things out. I also busted out my Tahitian vanilla for this cake. Tahitian vanilla is more floral than the classic Madagascar vanilla that most of us are used to. It is usually more noticeable in baked goods because of this, so I tend to save it for vanilla forward things where you won’t have the flavour overpowering anything else. Any other butterscotch chip ideas? Preheat the oven to 350F. Grease two 8-inch round cake pans and line bottoms with parchment rounds. In a medium measuring cup or bowl, lightly whisk the egg whites and whole egg. In a separate measuring cup or bowl, combine the buttermilk and vanilla. In the bowl of an electric mixer fitted with the paddle attachment, whisk together the flour, sugar, baking powder and salt. With the mixer set to low speed (2 on KitchenAid), add the cold butter one piece at a time, about 10 seconds apart. I took out about 1/3 of the butter cubes at a time and kept the rest in the fridge so they didn’t get too warm. Don’t get impatient. 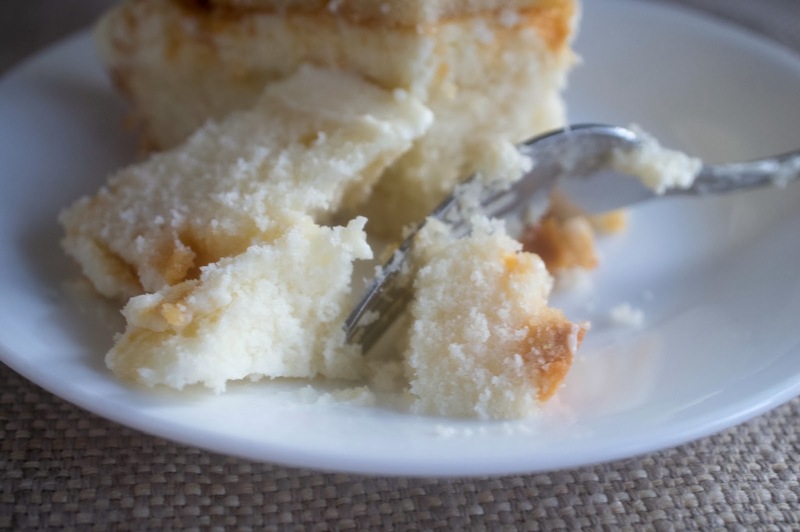 If you add the butter too fast or let it get too warm, it will form a dough with the flour, and then the cake will not turn out light and fluffy, but rather heavy. Trust, I speak from experience! Continue mixing on low speed until all of the butter has been blended and there are no clumps. Mixture should have a fine crumbly, cornmeal-like texture. With the mixer still on low, gradually add the buttermilk mixture to the dry ingredients, then increase speed to medium and mix for 4 minutes. Scrape the sides and bottom of the bowl to ensure all of the ingredients are well incorporated. Reduce the speed to low again and gradually add the egg mixture. Mix on medium for one minute, but no more. Toss the butterscotch chips with a few pinches of cake flour and gently fold into batter. The flour should help stop the chips from sinking to the bottom of the pan while baking. Most of mine sank anyway; it’s still delicious. Divide batter evenly among the prepared pans. If you’re worried about super even layers, you can weigh the batter on a kitchen scale. It should be about 675 g of batter in each pan. Bake in the centre of the preheated oven until a cake tester or wooden toothpick inserted into the center comes out with a few crumbs but no batter, 25-30 minutes. Let the layers cool in the pans for 10 minutes, then loosen sides with thin metal spatula or knife, turn out onto wire racks, peel of the paper liners, and let cool completely before frosting. In the bowl of an electric mixer with the whisk attachment, whip softened mascarpone until smooth. Add icing sugar and vanilla and blend on low speed until incorporated. With the mixer on low, gradually add the cold cream until incorporated. Increase speed to medium and whip until mixture thickens and becomes spreadable**. 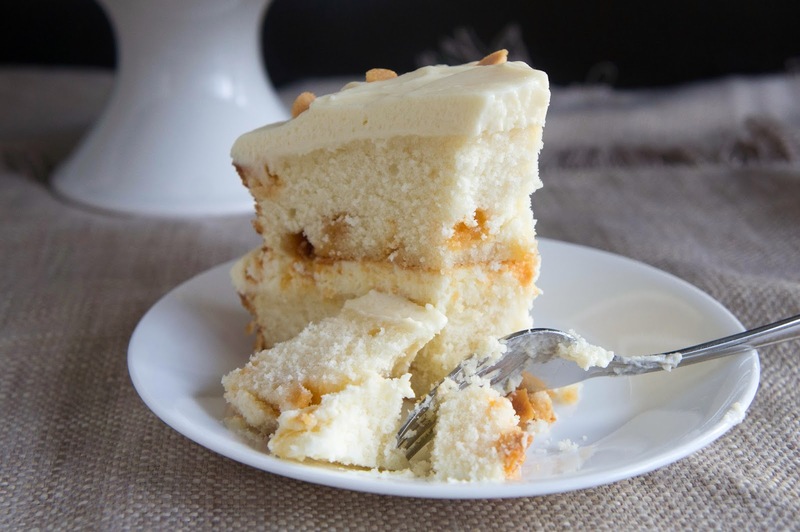 ** This is best done with a brand of whipping cream that whips easily to stiff peaks. If your cream does not whip easily, you should whip it to stiff peaks separately and then fold it into the mascarpone mixture. This is because you don’t want to whip the cheese for too long. Overwhipping could result in the frosting becoming runny as the warming cheese loses its water and dissolves the sugar. 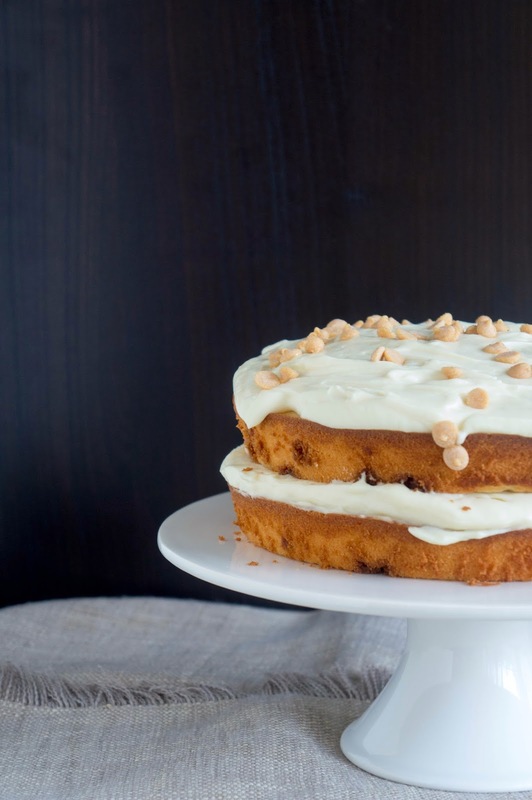 Spread half the frosting on one cake. Top with the other cake and spread with remaining frosting. OMG! Thank you for this! I've been badly wanting to make a wedding cake (for myself cos I'm selfish), and I've been having a devil of a time trying to figure out how to get it so dense. From your post, I'm guessing the trick is to reverse cream. Lovely photos - very enticing!! Thanks Hanna, my lone wolf commenter! The pack left me behind years ago!